We can mount any types of TVs on any types of walls safely and securely! High quality installation service for residential & commercial clients! The experts can install a cable trunking system to hide all cables away from view. Our TV installers in Melbourne will make sure you'll receive a theatre-like experience in your living room. The technicians will examine the wall and assist you with finding the safest location for your TV. They will investigate the material of the wall and find studs to secure the television. Before wall mounting the TV, our professional installers will consider the size of the TV and the viewing distance from the sitting point. Don't risk coming home to a broken screen, turn to the professionals! Whether the wall is able to carry the screen's weight depends on the material from which is made of. Usually, your handyman will have no trouble installing any display model on a brick or concrete wall. However, wall mounting a TV on the less durable plasterboard, tile, or lathe variants presents many challenges and the expert may have to fit your device to a sturdier structural element (i.e. timber) behind the wall. How much time will the TV installation service take? The bigger the screen, the more time it would generally take the specialist to get the job done. For instance, it usually takes 30 minutes to fit a 20" TV screen and about an hour to mount a 42" one. However, the overall duration of your TV wall mount installation will also depend on the type of wall you have, as well as on the type of brackets used. What should I do prior to my TV wall mounting appointment? We would kindly ask you to double-check if the brackets you’ve bought are suitable for your TV model. If you are not sure whether the brackets you own are the ones you need, the Melbourne specialist can gladly offer his assistance. Just choose a spot in your room with a suitable electrical outlet nearby and the skilled handyman will promptly take care of the rest. Ceiling brackets – usually used to mount TV projectors to the ceiling. Why stop here? 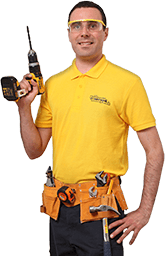 Repair everything around with Fantastic Handyman in Melbourne! Avoid daylight glare on your TV screen by ordering curtains or blinds installation. 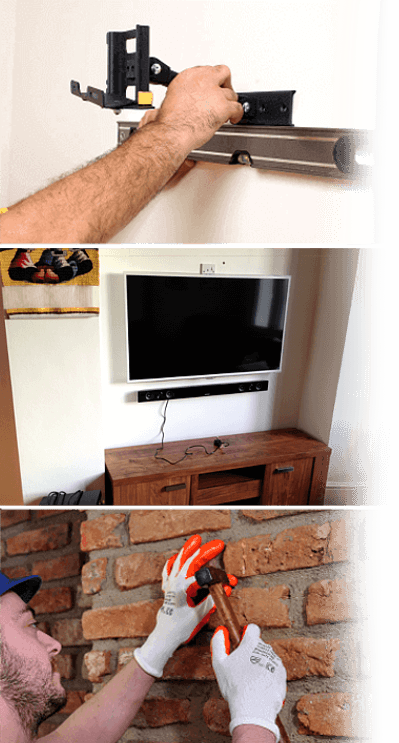 You can match tv wall installation and wall painting in a single session service. Also, you can include flat pack furniture assembly or light fixtures repairs.